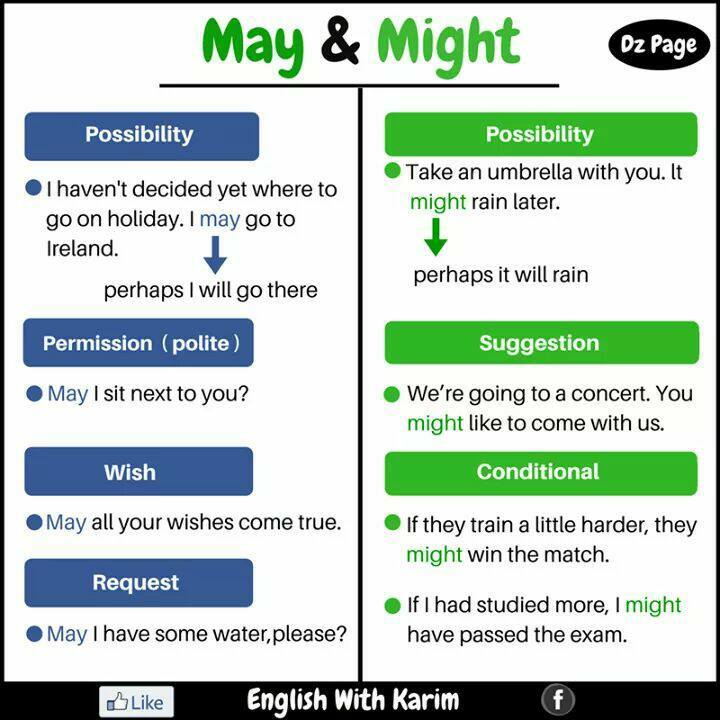 Home / Bahasa Inggris Kelas VIII / Modal "May"
'May' is a modal auxiliary. It does not take an 's' in the present tense. The past tense or conditional is 'might'. May I go out? no, you may not. It has no infinitive form. If you want to use it in a tense which is not present or past you have to use 'to be allowed to'. May I go out Mum? You may eat some cake Jim. He may be on holidays. He doesn't know what to do; he might ask Wendy. You might have done the washing-up ! May this year bring you happiness and health ! He might have been killed ! He may have phoned while I was having a shower. 1. Take your umbrella as it might rainedmay rainmay rains today. 2. He is still at work ! He may comesmight camemay come late I am afraid. 3. John couldn't repair his washing-machine; he might have askedmay askedmights ask his neighbour. 4. They talked too loudly. They might have wakemight has wokemight have woken the baby ! 5. Darling! I wonder if I might offermight offers you that marvellous car you saw yesterday ? 6. Mum ! My friends are having a party tonight ; may I gomay I gonemay they go please? 7. Sweetheart ! As you were at home, you might have donemay have donemight have do the ironing, don't you think ? 8. Yes darling, but I was afraid I might burnedmay burnmight have burnt your marvellous shirt ! 9. He might ismay beenmay be late because his flight has been delayed. 10. Look at those clouds ! It may rainwill may rainmays rain in a minute.